PLANTS: Perennial herbs to 50 cm tall; stems erect, branching above, densely covered with short recurved hairs and sparsely hirsute. LEAVES: elliptic to obovate, or the lower almost round, 2-6 cm long, 1-3 cm wide, ciliate and sparsely to moderately hirsute on both surfaces; apex and base acute; margin serrate on the distal 2/3, entire below; petioles about 1-8 mm long, less than 0.2 as long as the blade, with pubescence like the stems. SPIKES: mainly terminal, dense, 2.5-10 cm long, pistillate below and staminate above, often conspicuously red in flower because of the stigmas and the staminate bracts; bracts subtending pistillate flowers 5-12 mm long, with 5-7 lobes about 1/3 the length of the bract, sparsely hispid and ciliate and with a few yellowish stalked glands. ALLOMORPHIC FLOWERS: infrequent, when present replacing staminate portion of spike, pedicelled; ovary bilobed, hispid. FRUIT: ca. 2 mm long, ca. 2.7 mm wide, hispid mainly near the apex. SEEDS: 1.5-2 mm long, brown or yellowish, very finely pitted. NOTES: Along creeks and in grasslands and oak woodlands: Cochise, Pima, and Santa Cruz cos.; 1300-1950 m (4200-6400 ft); Jun-Oct; NM, TX; n Mex. 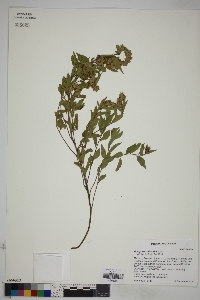 This species may not be distinct from A. phleoides Cav., which ranges through much of Mex. REFERENCES: Levin, Geoffrey A. Euphorbiaceae. Part 1. Acalypha and Cnidoscolus. J. Ariz. - Nev. Acad. Sci. 29(1): 18.